The Dutch Veenhuizen group builds, instals and services not only small and medium professional refrigeration units but also industrial installations. For remote monitorring of industrial installations there are various solu- tions available but not for the installations of SME's. for these enterprises the existing industrial systems are far to expensive and allow but a limited number of connections per location. The reason the Veenhuizen group decided to develop their own temperature monitoring system in collabora- tion with DPTechnics was obvious. We could assist them in developing the necessary hardware and software. Furthermor we had our own IoT platform, BlueCherry.io, that offers a complete back office and dash board for remote monitorring of IoT connected devices at a very competitive cost. In two words, we were able to realise the complete Veenhuizen projet as a single partner. No need to mention that this significantly reduced the TTM the Veenhuizen group had in mind. 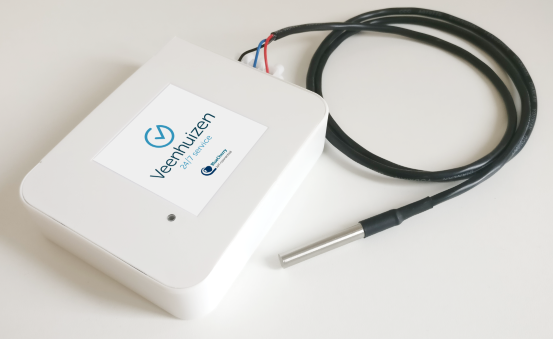 Using a multi-drop bus, up to 50 digital sensors can be connected to one single Veenhuizen IoT connective Temperature monitor. Should a bus of 80 m long not be suffiucient, a simple signal amplifier can double or triple the maximum lenght. The developed user interface insures swift and intuitive configuration. No need for specialised craftsman, nor for any specific programing skills. The Veenhuizen Temperature monitor can be set to send out alarms and HACCP conpliant reports to multiple adresses in various languages and formats. The log allows to look up temperature data until three years back in time. By being able to meet the demand of a large group of companies The Veenhuizen group now has a much stronger market position and faces an enormeous growth potential.